From 1974 to 1977, Fenton worked at IIT Research Institute in Chicago as a research engineer. He was responsible for obtaining and directing projects involving design, fabrication, and operation of aerosol sampling equipment, characterization of aerosols and particulate systems using the latest particle analyzing instruments, and supporting industrial sponsored projects. From 1977 to 1986 he joined the Mechanical Engineering Department at New Mexico State University. He began with half-time appointments in the New Mexico Solar Research Institute and the Mechanical Engineering Department and transitioned to a full-time assistant professor in 1982. 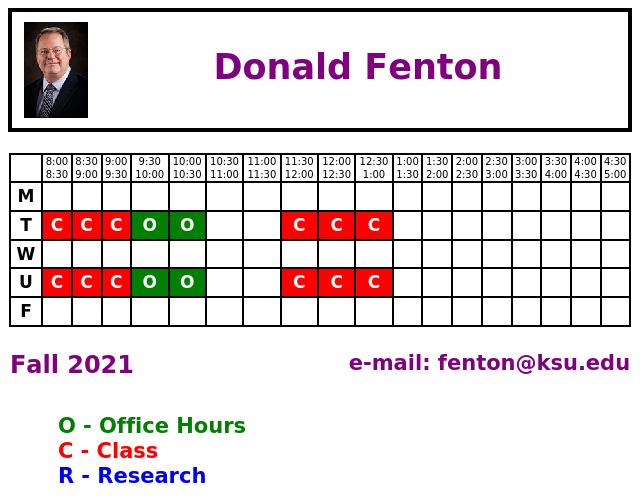 Fenton joined K-State in 1986 as an associate professor and was promoted to professor in 1992. He served as acting department head for the 1994-1995 academic year, the spring 1998 semester, and department head from fall 2009 to spring 2014. He is a licensed engineer in Kansas. Principle Investigator with numerous projects relating to refrigeration and energy conversion systems. Among these are quantitative risk assessment of ammonia release mitigation systems, analysis and simulation of emergency cooling systems, crud deposition on nuclear reactor cladding, ANSI/ASHRAE Standard 15 user’s manual, analysis and risk assessment of double-walled heat exchangers, characterization of forced ammonia plumes in the atmosphere, combustion of ammonia with and without oil, measurement of ammonia absorption into water, dynamic simulation of the steam-water side and the air-gas side of a coal-fired power plant and others. He has written more than 100 refereed articles, 50 technical final project reports, 3 books, 3 chapters. Industrial Refrigeration Workshop: First involved as assistant director in 1989 and became director in 1993. Continued in this capacity to the present time. Completed more than 35 workshops training over 1600 employees and academic personnel for work in the industrial refrigeration industry. Also, several offerings concerning industrial refrigeration in the meat industry. Fenton was appointed to chair the department’s graduate committee during the 1990’s, the department’s graduate level course offerings were overhauled. He personally developed ME 721, ME 811, ME 911, and ME 921. He served two terms in Faculty Senate with membership in several committees and one year as Chair of Academic Affairs (1999).